The Trees Campervan Trips: Week 2 Arcais - Pyla sur Mer. Week 2 Arcais - Pyla sur Mer. During the night there was another thunderstorm with the usual dramatic sheet lightning, thunder and rain. Come the morning - bright sunshine. Today was certainly a surprise and eventful! Graham awoke complaining he had a sore area on his abdomen. We have both recieved impressive insect bites over the last couple of days so Carol suggested he had made one bleed by scratching. It had been very hot the last couple of nights. During breakfast Graham exclaimed "It's not a scab it's got legs. Everytime I touch it the legs move like a crab trying to scurry away!" Sure enough on close examination it indeed did look as if he had an insect embedded in his tum. It is a bank holiday Monday - the nearest pharmacy is closed and the emergency telephone number not answering. 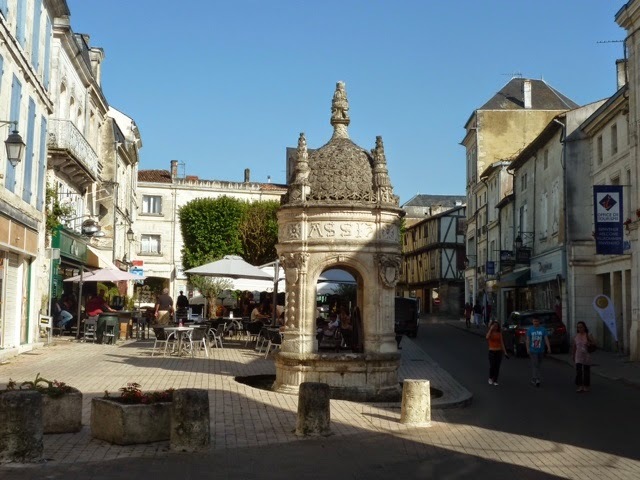 With the aid of the kind lady in the Tourist Information office, we find the nearest open pharmacy is the town of Niort aprox 20 kms away. We are torn: Graham wants to stick it out another day and names it Boris, Carol wants it seen to. Graham suspects there is an ulterior motive here. "If I can sleep another night with it why can't you? after all, our dog lived with them for days before we found out." Carol wins, its off to Niort. The pharmacist confirms it is "une tique" and wants nothing to do with it, they insist on the hospital - Carol was right. There we had a 2 hour stay in the emergency department before he was seen by a cool looking young doctor dressed in red converse trainers ,matching red watchstrap and designer glasses (someone noticed then!). After taking a personal call on his iphone, he removed "la tique" with a special "tique" removing device. It did take some time for the doctor to extract Boris - "I think he likes me " commented Graham. We left 12 euros lighter - thank you E111 card! 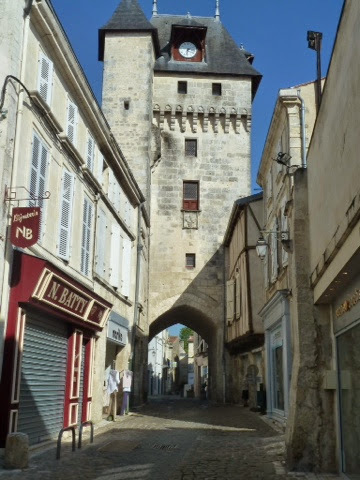 Never mind - we decided to go in to the centre of Niort, the capital of the 'Marais Poitevin, for a nice lunch and sightsee given we hoped to visit later in our trip. Niort was closed! No tourist attraction open and no restaurants to be found. Nothing. Rien. Our hope of lunch in an atmospheric bistro overlooking the river was thwarted! This is the Donjon. 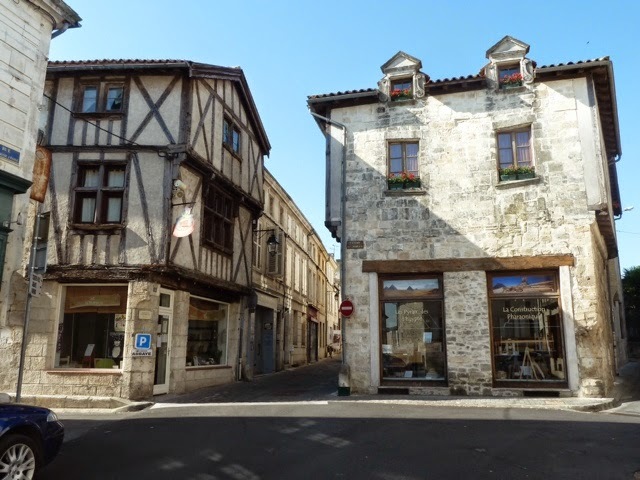 The most celebrated attraction in Niort - ou est tout le monde? Not sure if Carol is on a lean or the church really was! Still no people! Still the co-op was open on return to Arçais and Graham bought a bottle of sparkling wine - to celebrate the release of Boris! 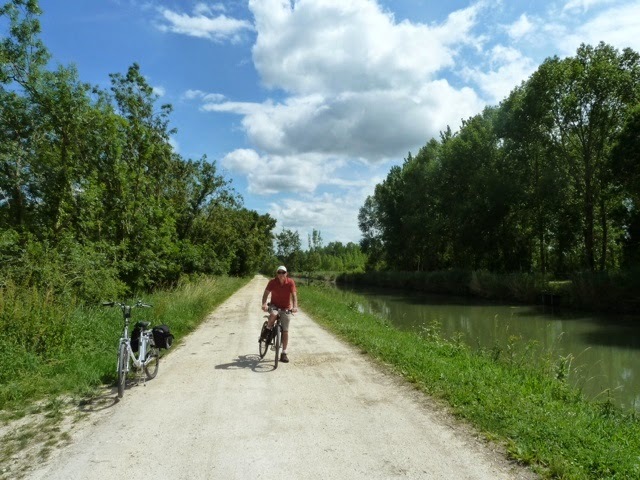 Today we cycled along the waterways- hurrah! What a peaceful picturesque part of the world this is. We passed just a handful of other cyclists or walkers the whole day. We cycled to just outside of St Hilaire la Palud to visit Les Oiseaux du Marais Poitevin Parc Ornithologique - a bird park with lots of species of geese,ducks and various other birds which are common in this area -or migrate through. Some common and some that are rarely seen. Although disappointed it was not a reserve to view wild birds, we were impressed with the way the park was laid out and spaces provided for the birds. 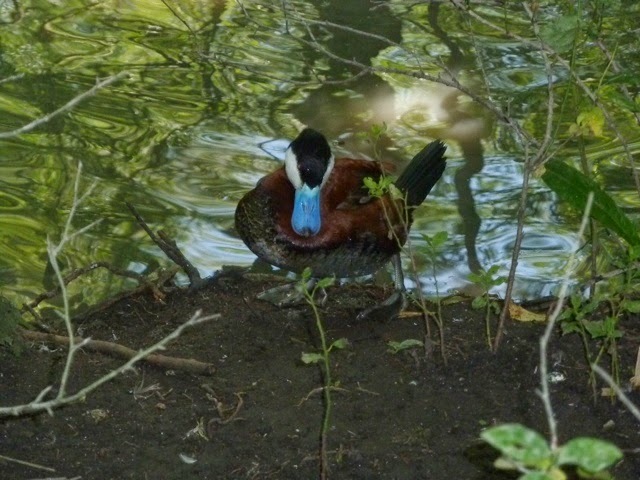 Ruddy Duck with blue beak. 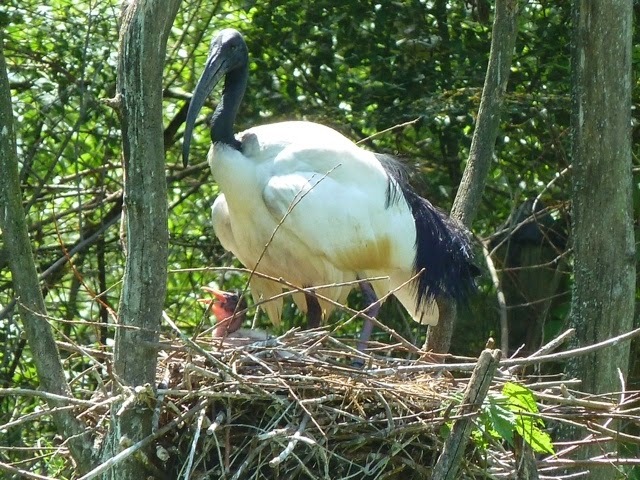 We saw some cranes with their rather large chicks on the nest and some teeny new African Ibis chicks also amongst many other species! We as usual took an unexpected detour back via Damvix - the maps are never as explicit as we'd like! A round trip of 16 miles - now that is reasonable thinks Carol. Tonight we eat out- Graham feels he should try eel which is a local speciality - we'll see! The restaurant in which we hoped to eat local specialities was closed! Thank goodness a small restaurant further up the road had saved their last table for us! 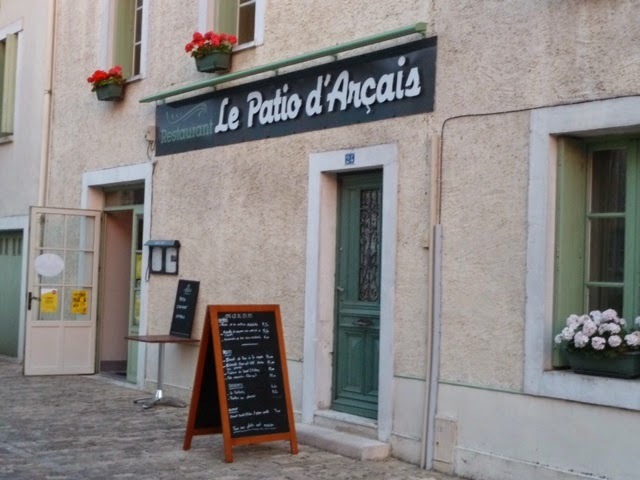 No eel but very good Sole Meurniere.We had an enjoyable meal at Le Patio de Arçais, It appeared to be a family run place (no English), the husband cooking and the wife front of house. Another trip advisor recommendation to be posted. 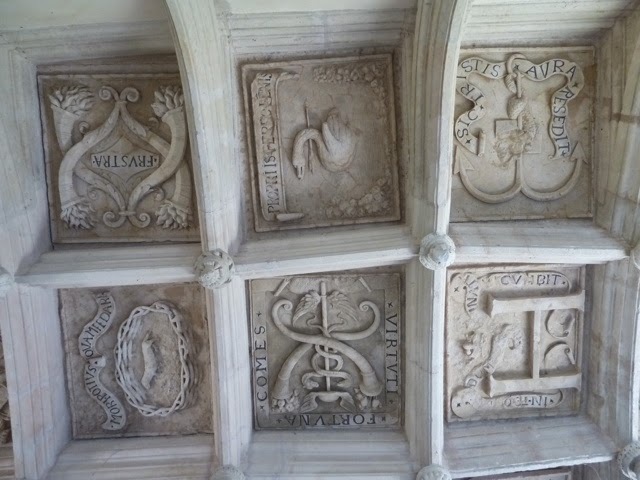 A couple of snaps of some local buildings. 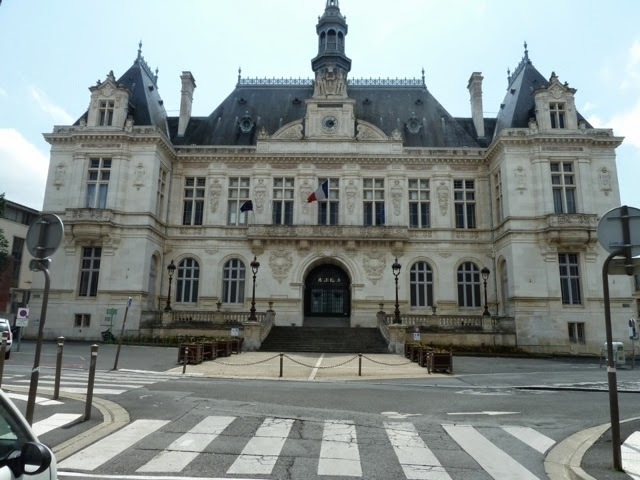 Tomorrow we head further inland to St Jean D'Angely. Despite Boris, we like Arçais, especially when all the day trippers have gone home. Score 8/10 for Camping la Taillee. Great location, basic but clean facilities. 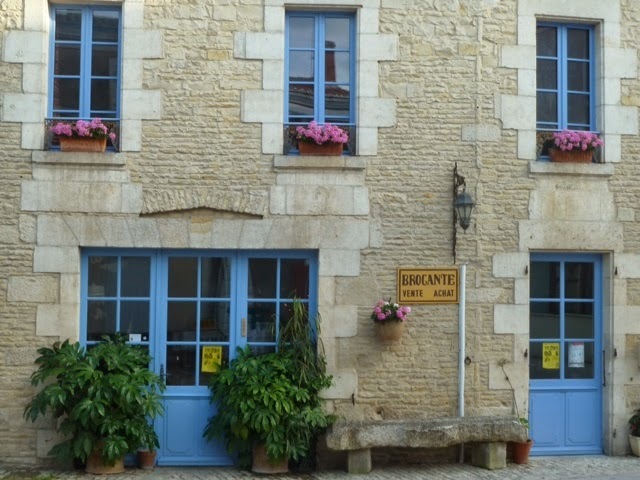 Today we travelled all the way to St Jean d"Angely on the D roads -bumping along through the countryside through lots of hamlets and villages. It really brought it home how very large and rural France is. A big shop in Leclerc supermarket.. where we were amazed by the number of English voices -we've been used to being the only anglais in the village for the past week! We spoke briefly to a couple who have a holiday home nearby - they spotted us as we were trying parasols for size and eying up gazebo's! The wife appeared to regret buying a property in a rural hamlet due to the amount of driving needed to get around. She said there are lots of properties for sale in the area, mostly English owned and it appeared to be a buyers market... Interesting. 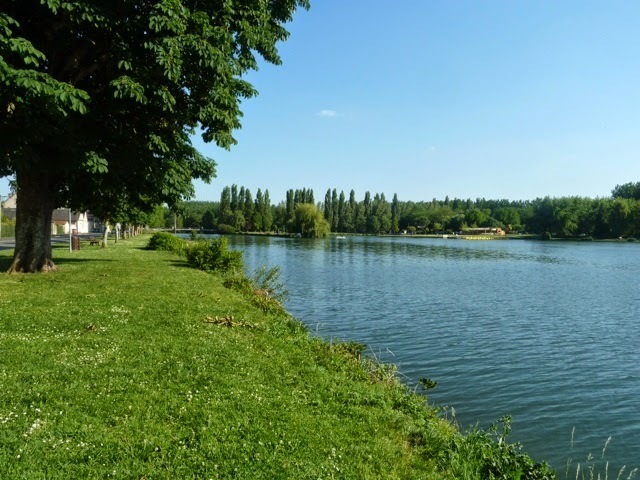 We travelled through the outskirts of St Jean -which appeared larger than we imagined-to our campsite -val de Boutonne situated opposite a lovely park area and the river. After dinner we spent an enjoyable evening drinking and talking with our next door neighbours Jaquie and Peter who have just bought a property in a nearby village with a gite attached. 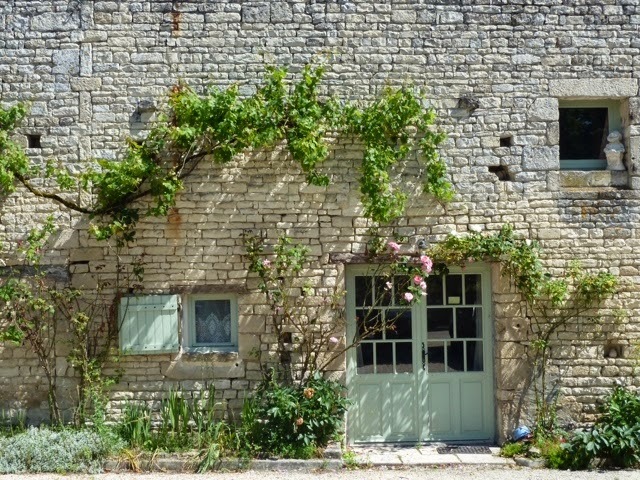 They hope to move in September to live and manage the gite -Jaquie having given up her teaching job in England and Peter hoping to work from here in his present IT job. We wish them well! It's very hot 30 degrees! We need a pool. We walked in to the old town centre doing a trail recommended on a tourist leaflet. 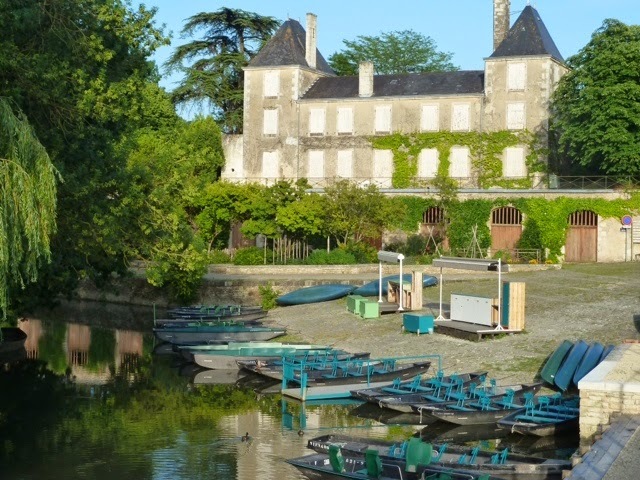 St. Jean D'Angély is as pretty as it sounds. 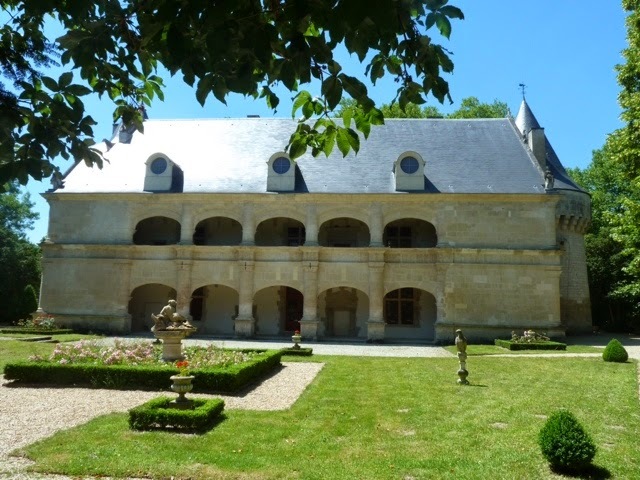 Ancient abbey, 15thC buildings, grand buldings, narrow streets, nice river and boating lake formed by the local river La Boutonne. Lots of restaurants and lots of Immobliers (Estate Agents). Bizarrely the historical attractions were shut - opening mid June- which shows how short the tourist season is here. After lunch we walked along the banks of the river to an old watermill. A tranquil wide river with a handful of fishermen and people walking along the path, a few children swimming. We wondered how busy this place gets in high season? Score - Minicipal St Jean D'Angely 8/10. Again a lovely location with basic clean facilities. Really the french have got it sussed - so far all the municipal campsites have been a credit to the towns and villages that provide them. June 13th, Day 12. 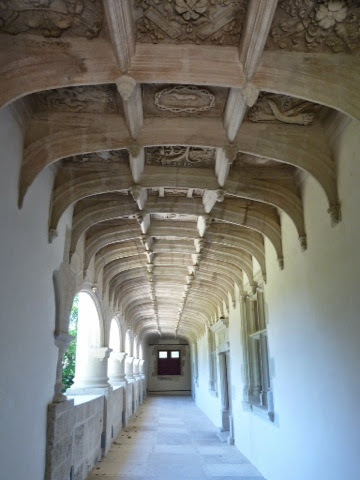 St Jean D'Angeley - Pons via Chateau de Dampierre. 90 kms aprox. We set off in time to arrive 12ish in Dampierre -Sur-Boutonne ready for the big french lunch shut down - when will we learn! A chatty couple from Cardiff who spend 6 months of the year over here at their holiday home gave us lots of tips on places to visit and nearby campsites - Thank you whoever you were. 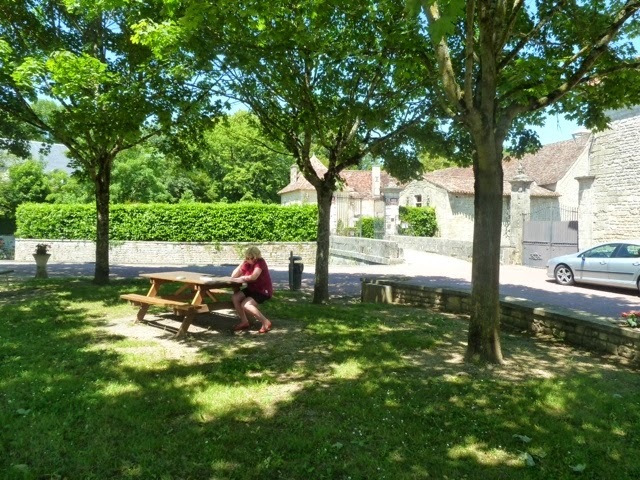 We had a picnic lunch looking on to some lovely village properties waiting for 2pm and then assembled as requested for the tour. and put back. Stainless steel ods and braces hold them in place. Onwards to Pons , driving through the Cognac vineyards, with snooty sat nav lady bellowing at us all the way as we chose to go via the D roads and not her route of choice. Arrived at the municipal campsite -welcomed by the totally french speaking warden. Pons again appears larger than we anticipated -we'll see tomorrow. June 14th Day 13 Pons. Again we are pleasantly surprised. 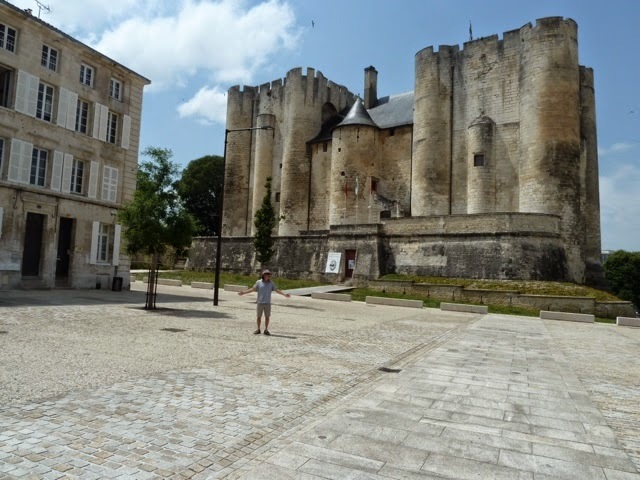 Pons has a lovely square with a Donjon (old keep), Hotel de Ville, cafes, fountains and gardens. The Hotel de Ville looks to be housed in an old chateau - we mused over the fact that in all the places we have been, (and not only in France), the Hotel de Ville and associated administrative offices (on left, below) appear to be in the most prestigious building in the town. As Graham comments "all citizens are equal but some who work for the council seem more favoured than others". As again we managed to arrive to visit just as lunchtime approached we lunched back on site and returned later in the afternoon. 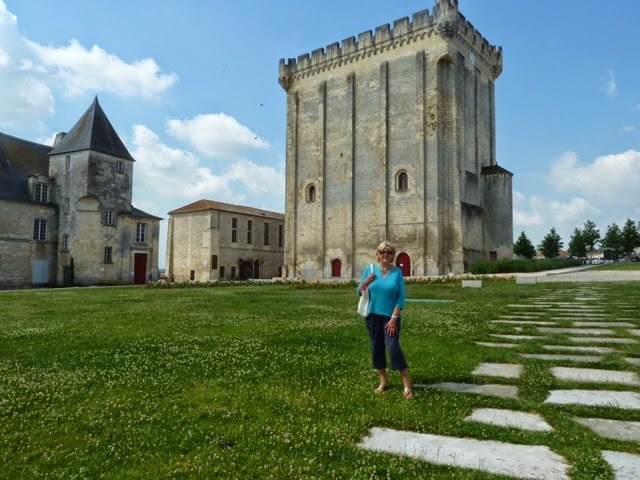 Still, a visit to the marché provided lunch and in the afternoon the Donjon was open!! Our cup runneth over -oh no it didn't - we forgot the camera! So all you get is a pic from the bottom, taken in the morning. 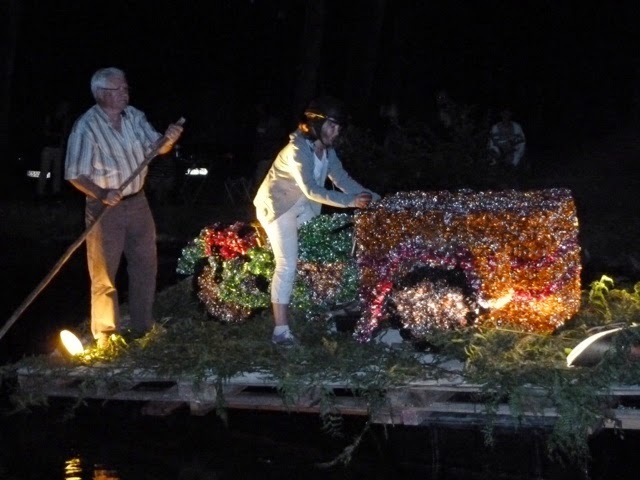 We detoured back along the river and came across people making decorated barges and a stage being set up for musicians, bars being constructed and chairs laid out. We presume it is a local celebration/event and see if we can blag an invite. Graham managed to communicate enough with the locals to discover all tickets "pour manger" were sold but we could return tonight to hear the music for free as long as but we buy some beer at 2 euros. We think we will have a wander down after dinner. We turn up at 9pm. A band was playing some Irish and some French tunes in the style of Roland Rivron - you know the sort of thing: a bit subdued, embarrassed to be singing. We thought they were an English band - but on questioning a band member they were actually French - not sure he was flattered that we thought he was English, but at least he was off the stage now. "Les Crabes". 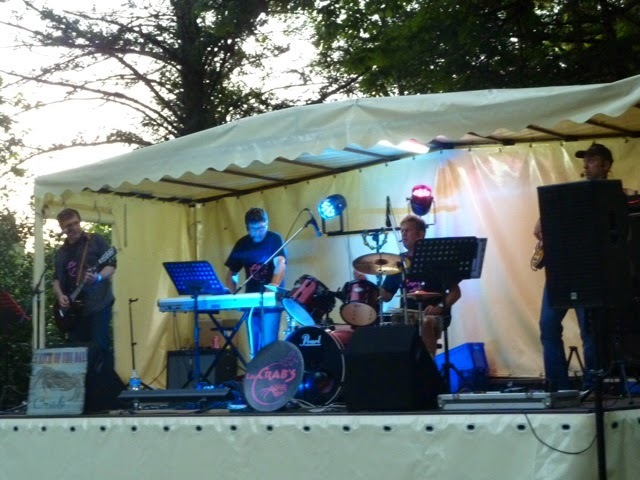 Available to book: Fetes, Mariages, No gig too small. The dinner barely finished and suddenly all chairs were scooped up to face the river Ah-ha. So this is what it's all about. 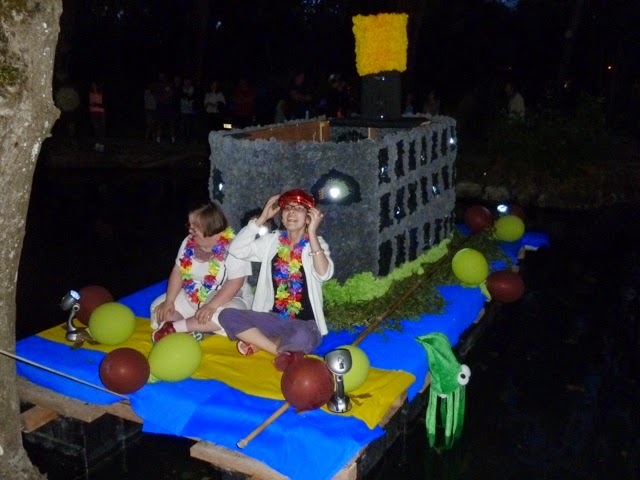 Lots of barges with decorated and illuminated floats were announced and floated down the river to applause from the many people gathered along the shore of the river - which was illuminated with little coloured fairy lights. 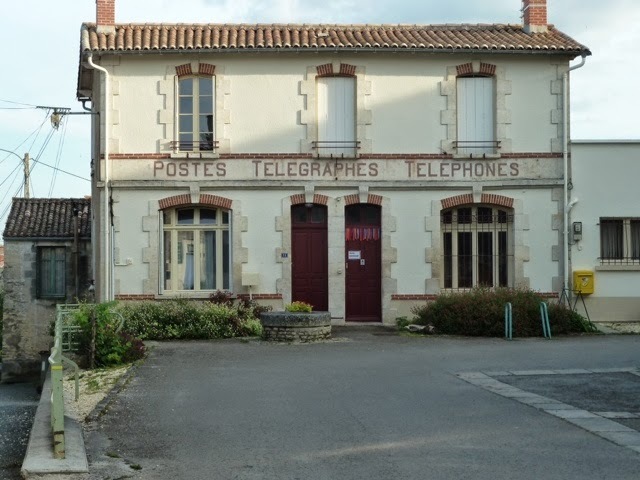 Unfortunately the PA system was a little eratic - giving the feel of a Norman Collier broken microphone routine - "Et Main.nt ns avons les... les ..irs avis" The announcer laughing heartily as he announced each entry - we think he may have been on the pastis, and why not. Everyone joined in congratulating the participants, with good natured banter and I'm sure a great evening was had by all. We left the party early as we are driving South tomorrow. June 15th Day 14th. 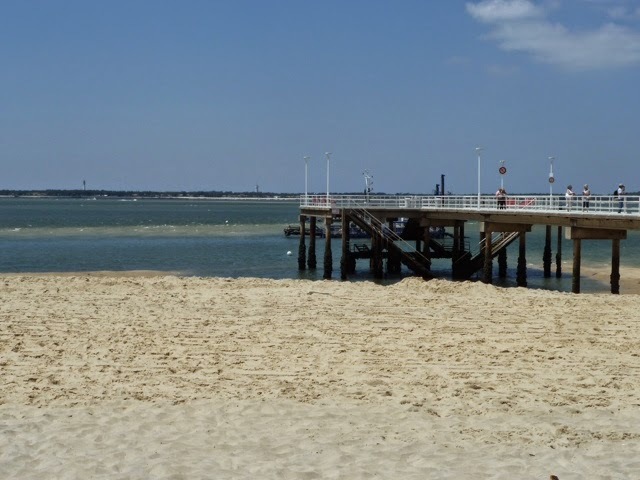 Pons - Pyla sur Mer, Arcachon. 201 kms. 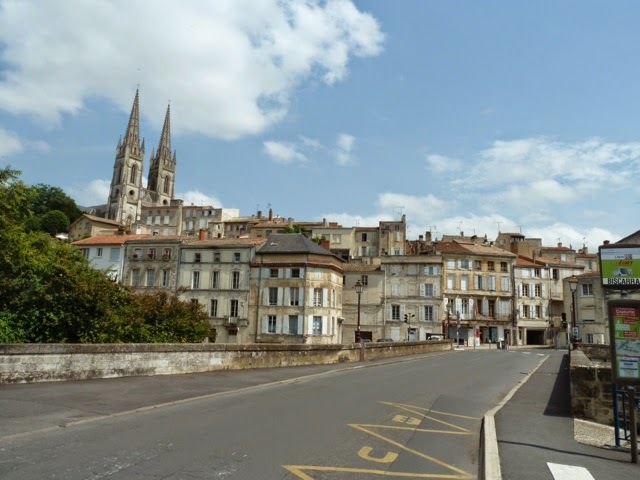 We travel to Blaye with the hope of catching a ferry across the Gironde river to avoid going via Bordeaux. Unfortunately we arrived just after 12 to discover the next ferry was 3pm. A dilemma! There are no open ticket offices. Will the ferry actually run? How big is it? There are a lot of cars parked at the fort next to the ferry - would we get on it? After a short discuss we decided to mix it on the autoroute round Bordeaux and arrived in Pyla sur Mer just after 2pm! We find the autoroute horrible after our quiet, rural roads. The campsite is the most commercial one yet - has several pools, a bar, a restaurant, creperie etc. 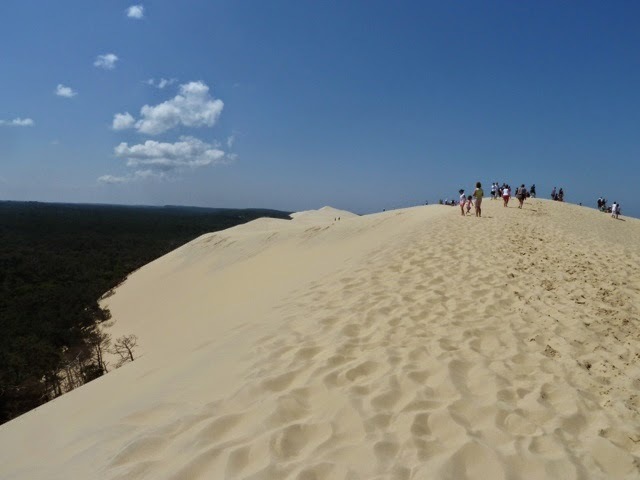 However it is situated near the Dune of Pilat - the largest sand dune in Europe. Driving by looking for our chosen campsite we pass others, one with a massive sand coloured building within: What were they thinking - building a massive indoor pool complex? Later we realise. This is not a building, this is .... The Dune. We settle in and scramble down to the beach with the dune looming nearby - we are on the edge with a paraglider's take-off and landing point. 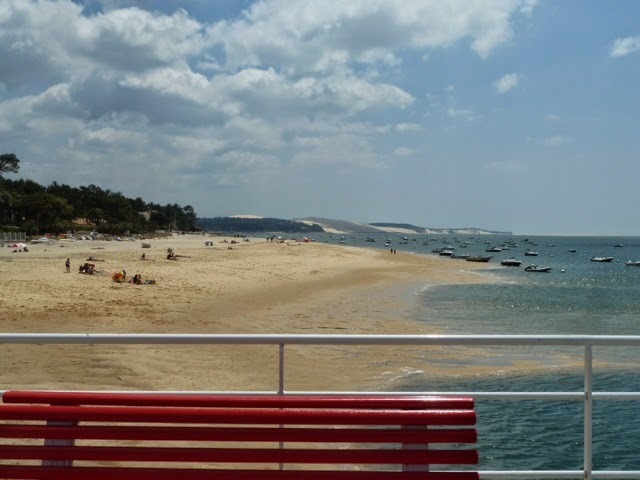 Tomorrow we hope to take the bus from the site in to Arcachon. We dine listening to cheers from the direction of the bar. France are playing and it's an easy win. We introduce ourselves to the Brits opposite and after inspecting each other's vans we had a few glasses of wine and a chat. 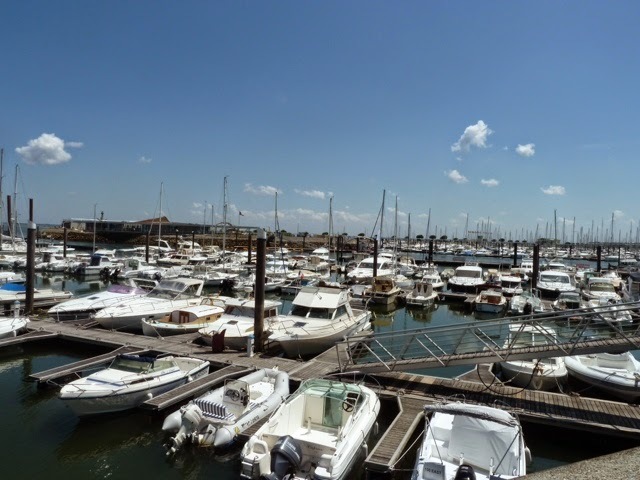 Roy and Jennifer are going off tomorrow towards Ille d'Oleron-they hoped to set off at 8am -some hope considering the amount of wine tasting and putting the world to rights! They wobbled back to their van at midnight. Roy and Jen left at 9.30 am -good effort! Graham waved farewell bleary eyed from his bed but thinks they did not see him -probably for the best. Over breakfast we think of them, heads throbbing on the autoroute to Bordeaux. There is a bus stop just outside the site -very convenient-and just one euro to Arcachon. 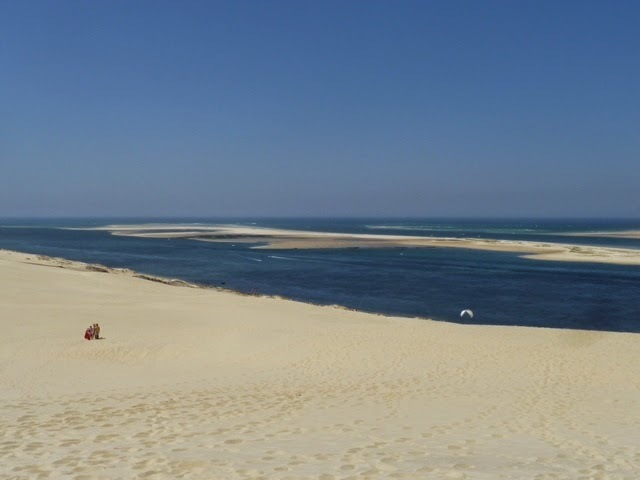 The Arcachon Basin is a large sea lake, about 60 square miles in area and shallow in places, but never dries. Perfect for swimming. 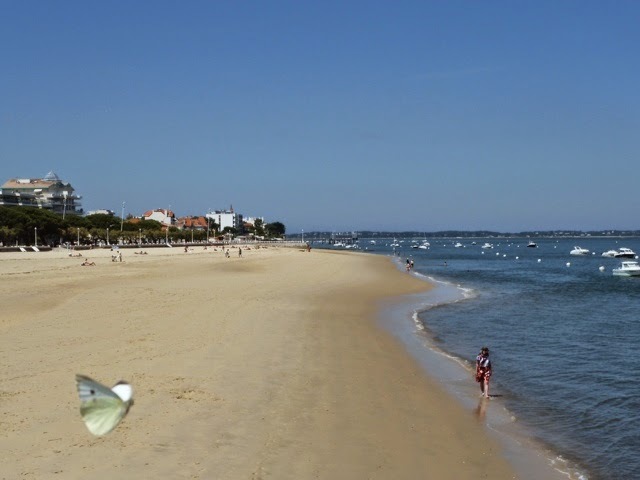 Arcachon itself is the biggest town and the place where the Bordelais take their holidays. It is pretty swanky, like Sandbanks in Dorset but more extensive. Miles of sandy beach with wide promenades. Piers leading into the water from where you can catch ferries to Cap Ferret across the Arcachon basin. A massive marina. Uncrowded - but we can imagine the scene at the height of summer. Butterfly just had to get in the picture! We lunched in a restaurant along the promenade - guess what Carol had! Unfortunately had to make do with just half a bottle of wine as it cost the same as a bottle at all the other places we have eaten at so far! We walked through Arcachon to a residential area called The Ville d'Hiver (winter town). 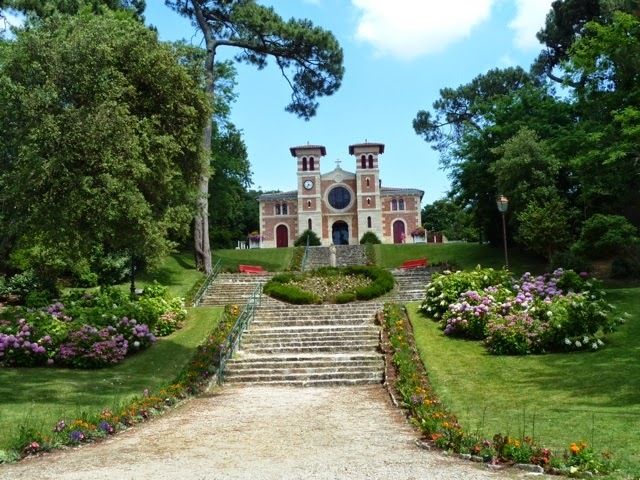 This was created by the Pereira brothers in 1862 when 300 villas were designed by a famous architect and a landscape designer. Every villa is different -for those who know Hull it looked like a (much) grander version of Newland Park. The only people about were workmen, freshening up the villas for their wealthy owners to visit next month. Prices start at €1m but you don't get much for that - figure on more like €3m. We hoped they didn't think we were casing the joint as Carol peered through hedges and trees snapping away with her camera. Back on site another dinner was interrupted by cheers from the bar. This time German ones. We thought momentarily we might go along to support Portugal but couldn't face it. After all became tranquil again we crept to the bar to see that indeed it looks like Germany won convincingly. Well deserved I'm sure. From what we could decipher Portugal got nil points -so we wandered off for an evening stroll content that at least Christiano Ronaldo would be without his usual smug smile this evening!! 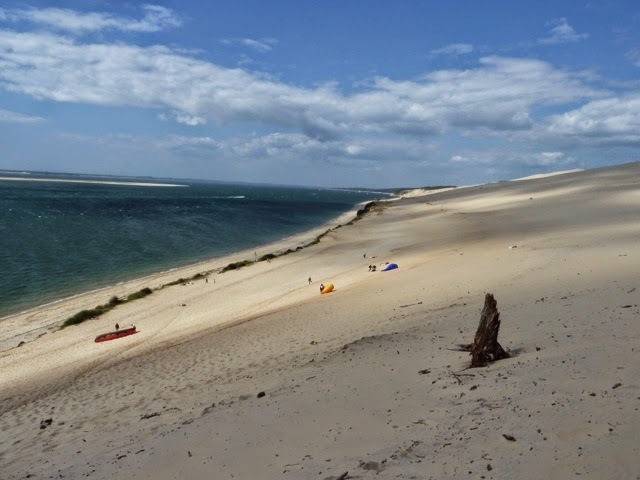 Tomorrow we plan to cycle to the Dune and picnic -possibly try to catch a ferry to Cap Ferret. Today is Dune-day. 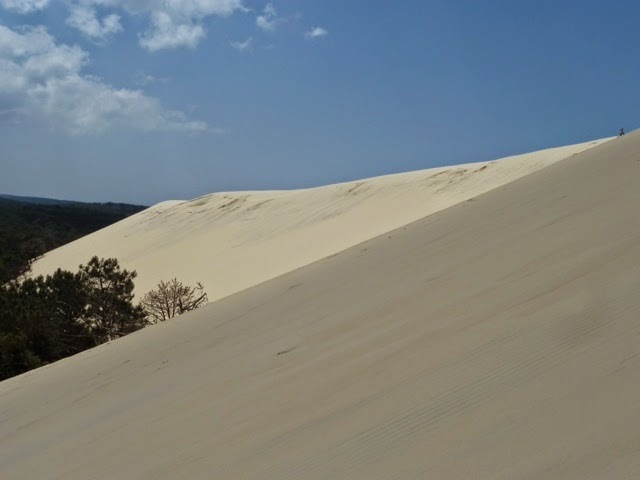 We cycle to Pyla - Dune de Pilat -and find ourselves passing a coach park, oh dear. Actually, it's not that bad. There are a few tourist shops and cafes doing fairly brisk business on the path to the dune, but they don't sway us, oh no. 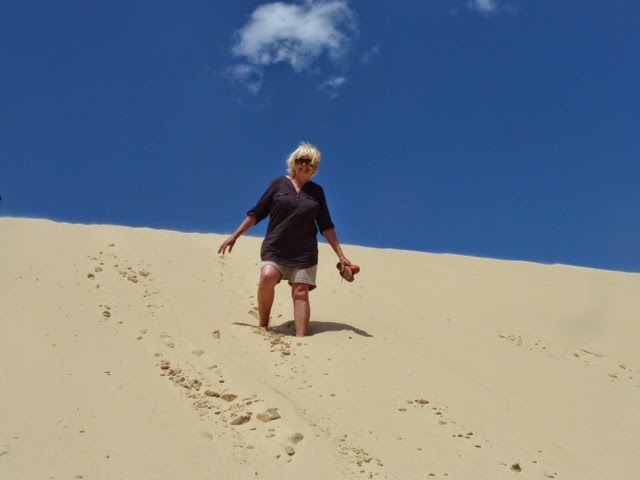 They've put steps up the dune so actually it's quite an easy climb. Without the steps it is very hard going, your foot slips back through the sand to nearly the same place it started out, so Graham quicky gives up and joins Carol on the step route. The top is jaw droppingly amazing. The photos don't do it justice. We are on top of the highest dune in Europe. Currently 117m (384ft) high and growing at 2m each year, it is 0.5km wide and 3km (2 miles) long. It's shape is not uniform, gently sloping up from the sea and then dropping sharply into the forest, fittingly, a bit like a wave. There are a few people up here, but it's not mobbed and there is room for everyone. The views over the sea are amazing and can't be captured on film. In line with Cap Feret is another sand bank and another forming further towards to land. 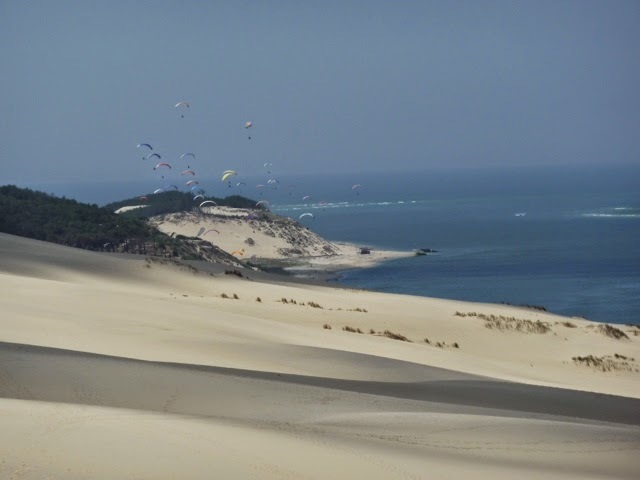 Yachts shelter in the lee of the sand banks and paragliders use the dune as a launch pad. If only Spurn Point was like this! We stay for around an hour and then come down the quick way! We seem to drag a lot of sand down with us, Im surprised there's any left on top. 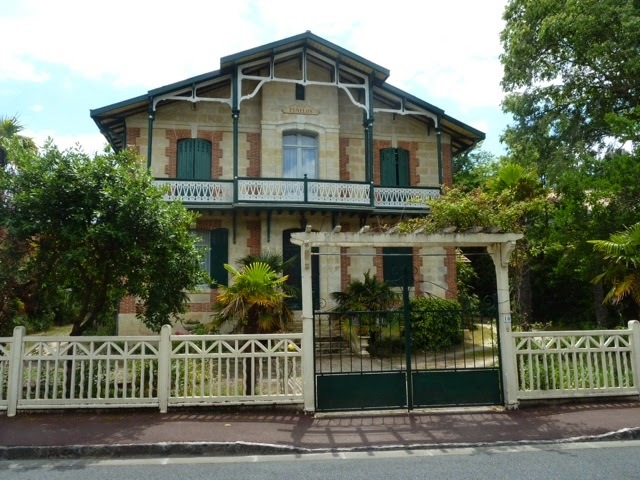 We cycled in to Pyla sur Mer passing more very upmarket properties - it again feels very clean and affluent. We arrive at the pier where the ferry to Cap Ferret goes from to discover the ferry service doesn't start til 5th July - quelle surprise!! We picnic overlooking the beach -weather continues to be mostly sunny and a pleasant 22 degrees. And had a little walk and paddle along the beach. Here is the pier that what the ferry would have gone from! And a view of the beach with the dune in the background, a short cycle ride away. We had a stroll further into Pyla and came across the local church in beautiful surroundings. 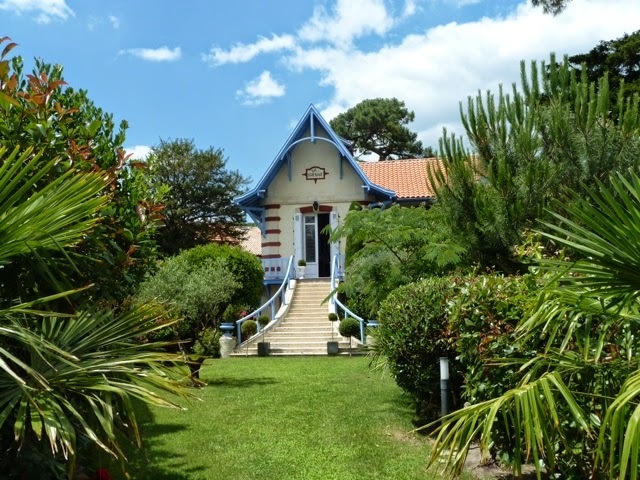 Headed back to the campsite for dinner chez Rex and to plan our journey as we hope to travel through the Landes area on to Biarritz tomorrow. Bye bye sophisicated but expensive Arcachon.